The month when the world seems to be in grayscale – but luckily, you Hawaiian shirt heroes know how to bring colour back into our lives. From awesome wardrobe changes to some of the internet’s coolest pets, here’s what you’ve been up to. May the Aloha be with you. Ever wondered what your favourite film characters get up to when they’re not entertaining you on screen? Well one very special little Star Wars Porg likes nothing more than jumping from the planet Anch-To and into a stylish Hawaiian shirt at the weekend. I definitely think the force – and the Aloha – is strong with this one! Who said dad shirts were lame? On a recent visit to see his parents in Portland, DJ Stefan Aronsen came up with an ingenious plan to save money on a flight that wanted to charge extra for his luggage. He just didn’t pack any clothes, so he didn’t need a suitcase. His plan instead? Borrow his dad’s clothes! Specifically, his selection of super cool Hawaiian shirts. (Clearly his dad has style!) It was really hard to choose, but I think my favourite outfit of the week would be the sushi date one! DAY 2: I stole my dad’s @reynspooner shirt, featuring inside-out print, sophisticated pink pattern, and classical tailoring. I found it paired well with @burgerville! Furry fashionistas get in on the action. It’s not just the humans going Hawaiian! This month I’ve also had my fair share of pet photos and they are truly awesome! 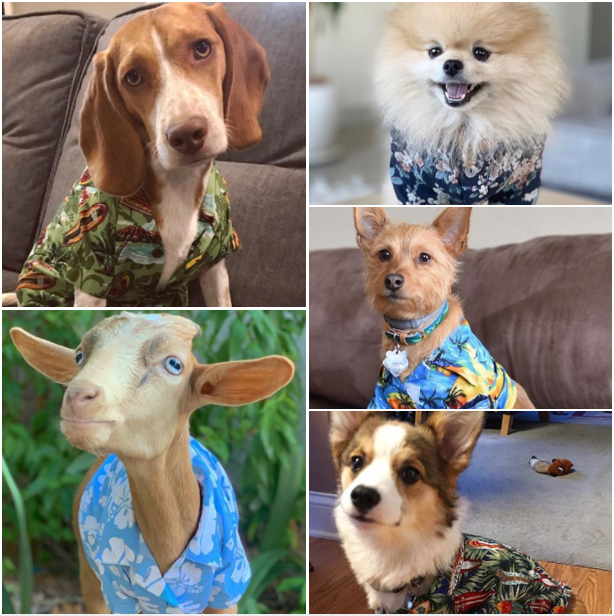 From joyous clouds of fluff, adorable puppy dog eyes and a funky little goat named Elliot, to playful friends for life and Dewey the corgi, our furry friends know how to rock a Hawaiian shirt like real heroes – they might not save the world every day, but they’ve sure won our hearts! And you know what else is awesome? Kids in Hawaiian shirts. When it comes to wowing the world with colour and pattern, you can never start too early, that’s what I say! Just look at these little guys! Dani Leigh, photographer and mother of these 2 little legends, took this cracking photo on a recent family trip to Maui island. I hope this is the first of many more Hawaiian themed family photos to come! Well that’s it for this month, guys. The next round-up will be out on Friday 8th March. Can’t wait to report back on what you lovely folks get up to in February. Until then heroes… keep it Hawaiian!